VIRAL: Senator Trillanes IV Bullied By Duterte's Supporters! 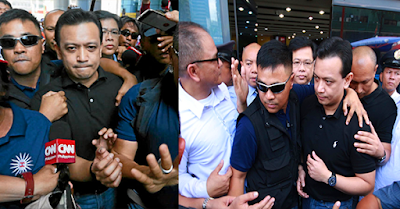 Last Monday, Senator Trillanes IVwas bullied by the crowd while on his way out from the bank. That day was the presentation of his affidavit against presidential candidate Mayor Rodrigo Duterte. The crowd was Duterte's supporters and they were shouting and mobbing Senator Trillanes. The senator seemed to be frightened by the big crowd while walking into his car. The people were shouting the name of their presidential bet.